Springworks Farm, a commercial aquaponics operation in Lisbon. Aquaponics sounds like the stuff of science fiction. Instead of crops’ roots reaching down into the soil, they are suspended in water that is filled with live, swimming fish that sustain the plants with their nutrient-rich excrement. The closed-loop system is generally less disease prone and more water efficient than soil-based gardening, and at the end of the day, farmers can sell plants from above the waterline and the fish from below. The innovative growing method has the potential to make a splash in Maine’s agricultural scene, but first, it has to overcome market roadblocks and a marred past. The only active commercial aquaponics growing operation in Maine is Springworks Farm in Lisbon. Trevor Kenkel, the company’s founder, broke ground on Springworks Farm five years ago, when he was just weeks into his freshman year at Bowdoin College in Brunswick. The 6,000-square-foot facility raises tilapia and grows five different types of lettuce. Kenkel said the farm provides produce and fish to about 25 Hannafords and several distributors. Along with their eco-friendly bona fides, aquaponic systems can provide local produce year-round, even during Maine’s harsh winters. “Maine has a really strong local food movement that I think is really supportive of an operation like this that can produce local food all year,” Kenkel said. Growing local has an added sustainability benefit: reducing food miles. 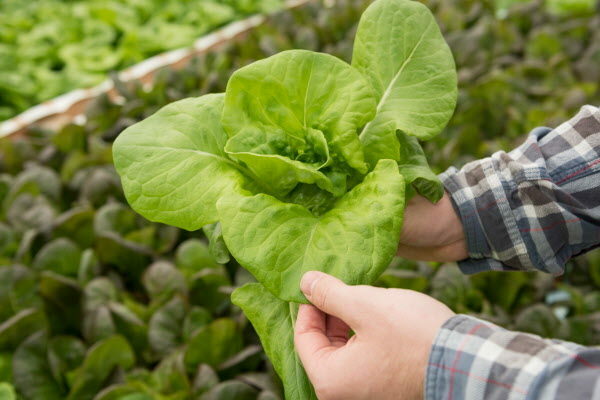 Most of the lettuce in the United States is grown in California and Arizona, whereas Maine-grown aquaponic lettuce does not accrue the carbon generated by a cross-country journey. “In terms of carbon use, the amount that you save by reducing the 2,500-mile trucking journey to 200 miles is really incredible,” Kenkel said. Kenkel said that Springworks Farm is still in “growth mode,” but the outlook is good. It recently broke ground on a second greenhouse. Trevor Kenkel, founder of Springworks Farm, a commercial aquaponics operation based in Lisbon. But promising aquaponics operations have failed in Maine before. 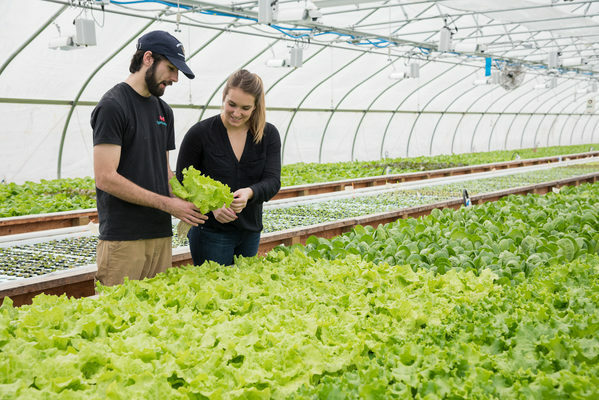 Fluid Farms, billed as the first commercial aquaponics operation in the state, was founded in 2013 in Dresden following a successful Kickstarter campaign that raised more than $9,000. In 2016, it won the $50,000 grand prize in Gorham Savings Bank’s LaunchPad competition. The company was even certified organic by Maine Organic Farmers and Gardeners Association. Now, only a few years later, Fluid Farms appears to be no longer operational. According to the Maine secretary of state’s office, Fluid Farms administratively dissolved in 2018. Tyler Gaudet, one of the founders, declined to comment on what happened to the company. Aquaponics is used primarily as a learning tool in Maine. Maine Agrotech in St. Albans, designs, installs and provides technical support for small-scale aquaponic systems throughout the state. Jeff Giallombardo, Maine Agrotech’s founder, said most of its customers are universities and high schools, though he has installed a few at private residences as well. “The interest now seems to be in the education sector,” he said. 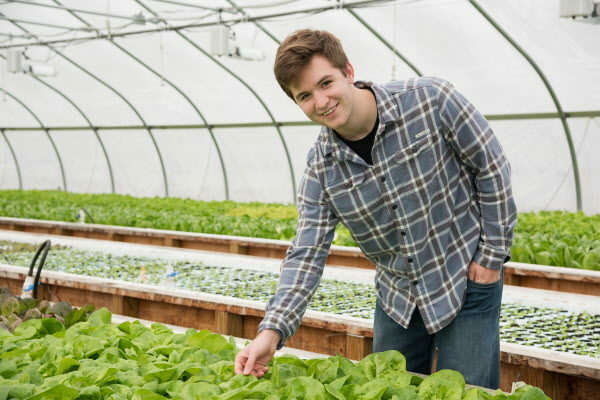 Giallombardo started Maine Agrotech after using aquaponics as an educational tool for an alternative education program for Nokomis Regional High School in Newport. Education is built into the business model for Springworks Farm, too. Kenkel said the farm has been an educational operation “from the start,” conducting tours and selling small aquaponics kits for aquariums as a didactic tool. Lettuce grown at Springworks Farm, a commercial aquaponics operation based in Lisbon. University of Southern Maine is one of the schools that takes regular field trips to Springworks Farm. Theodore Willis, associate research professor at the university, started using aquaponics to teach a land-based aquaculture and research methods class in August 2017. The 10-tank aquaponics system — housed in a university laboratory — grows lettuce, celery, bell peppers and kale alongside tilapia, which is the fish most commonly used in aquaponic systems. In Willis’ experience, aquaponics is a valuable learning tool, but can be challenging to manage. During the school year, Willis has a steady stream of students to help tend the system, and the school cafeteria and catering services use the produce grown in meals on campus. Summer vacation, on the other hand, proves challenging. On a larger scale, the small university scheduling issues could translate into real world roadblocks for commercial aquaponics operations. “If you have any aquaculture system on a large scale, you have to have the financial backing and the personnel to keep it running,” Willis said. Like at the university, having consumers for aquaponically grown products is also essential to the operation’s success. Unlike at the university — Willis said he is not looking to make money off of its system — consumer preferences matter for commercial operations. Aquaponically grown crops also tend to be more expensive than their soil-based commercial farmed counterparts. Associate research professor Theodore Willis growing aquaponics at the University of Southern Maine. Finding a market for aquaponically grown food and fish in Maine is also going to be a challenge. American consumers have less of a taste for tilapia, the primary fish grown in aquaponic systems. Tilapia is, as Willis described, “a bulletproof teaching fish” because it is so hardy and forgiving. But it is difficult to sell. Not only is it challenging to turn a profit on aquaponically grown products, but also the upfront costs for the energy and infrastructure required for an aquaponics operation are steep. The extreme weather conditions throughout the year make keeping the system at relative stasis especially difficult in Maine. These roadblocks could have prevented commercial aquaponics operations from succeeding in the past in Maine. 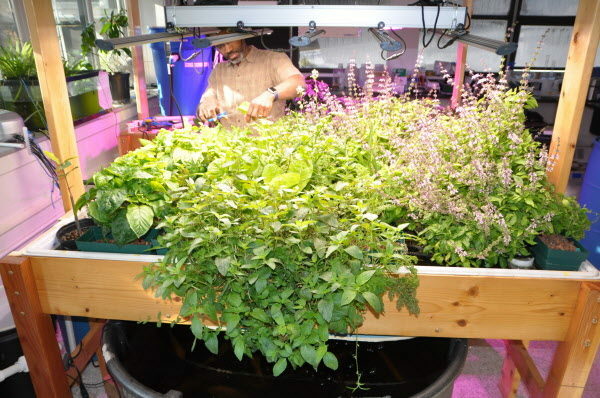 Giallombardo believes culinary herbs are an opportunity for aquaponic growers, as most of the herbs sold in supermarkets are grown in the southern United States. The educational interest in aquaponics across Maine could help with one of its biggest barriers to entry: knowledge. “People just don’t know enough about aquaponics here,” Giallombardo said. 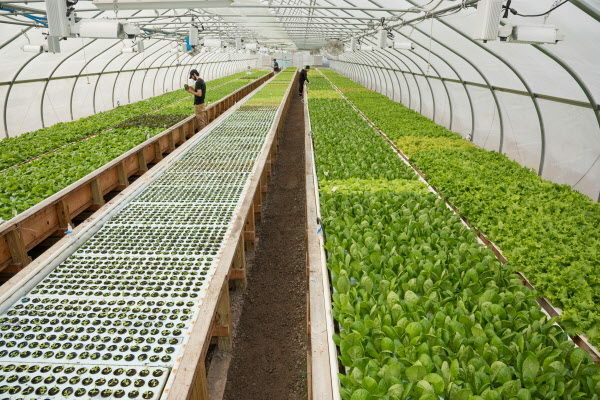 Giallombardo predicts that the aquaponics industry, as well as similar industries like recirculating aquaculture and indoor agriculture, will only continue to grow in Maine. The proliferance of aquaponics learning tools in classrooms, he said, will prove especially useful as job training. “You can use these systems really to educate on all of these industries and prepare students for jobs that are no doubt going to be there soon,” Giallombardo said. Though Springworks Farm still stands alone, Kenkel is also hopeful about the potential for small-scale growers, whether in classrooms or their own homes, to branch out in the future. Correction: An earlier version of this report misstated the name of the organization Maine Organic Farmers and Gardeners Association.